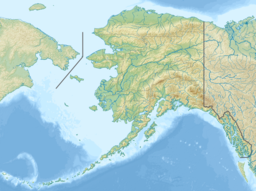 Mount Okmok is the highest point on the rim of Okmok Caldera (Unmagim Anatuu in Aleut) on the northeastern part of Umnak Island in the eastern Aleutian Islands of Alaska. This 5.8 mile (9.3 km) wide circular caldera truncates the top of a large shield volcano. A crater lake once filled much of the caldera, but the lake ultimately drained through a notch eroded in the northeast rim. The prehistoric lake attained a maximum depth of about 150 m (500 ft) and the upper surface reached an elevation of about 475 m (1560 ft), at which point it overtopped the low point of the caldera rim. Small, shallow remnants of the lake remained north of Cone D at an altitude of about 1075 feet: a small shallow lake located between the caldera rim and Cone D; a smaller lake (named Cone B Lake) farther north near the caldera's gate. After the 2008 eruption, the hydrogeology of the caldera was greatly changed with five separate sizable lakes now emplaced. In addition to the caldera lakes, Cone A, Cone E, Cone G and the new 2008 vent on Cone D contain small crater lakes. The last major eruptions of Okmok—with a VEI strength of 6—occurred 8,300 and 2,400 years Before Present. Aerial view looking across Okmok Caldera. Following the formation of the caldera, numerous satellite cones and lava domes have formed on the flanks of the volcano. They include Mount Tulik (1,253 meters (4,111 ft)), Mount Idak (585 meters (1,919 ft)), and Jag Peak. Mount Tulik erupted in 1936. The volcano is currently rated by the Alaska Volcano Observatory as Aviation Alert Level Green and Volcanic-alert Level Normal. On Saturday, July 12, 2008, Okmok Caldera exploded without warning, sending a plume of ash to 50,000 feet (15,000 m) into the air. Map showing volcanoes of Alaska. The mark is set at the location of Mount Okmok. During the following five and a half days of nearly continuous eruption, residents of Nikolski (47 miles southwest) were stranded for periods of up to three weeks; Unalaska (73 miles northeast) was repeatedly dusted with ash and flights into and out of this major fishing hub were frequently disrupted; floating rafts of scoria and low visibility prompted the Coast Guard to close Umnak Pass to marine traffic; and the Bering Pacific cattle ranch on the flanks of Okmok was periodically evacuated, once during noon-time darkness caused by heavy ash fall. The eruption ended in August 2008. It had a VEI of 4, giving it a rating of "cataclysmic." No lava flow was reported in this eruption, though the volcano has issued flows in the past. The eruption took place at a new vent in the northeast part of the caldera, creating a roughly 800 ft high cone, dramatically altering caldera hydrology, and discharging huge lahars, or volcanic mudflows, running from the caldera to the coast. In contrast, all 20th-century eruptions were from a cone near the southern rim of the caldera. The 2008 eruption was by far the largest eruption at Okmok since at least the early 13th century. ^ a b Okmok – Introduction. Avo.alaska.edu (2008-07-12). Retrieved on 2010-11-24. ^ Miller, Thomas P.; Smith, Robert L. (1987). "Late Quaternary caldera-forming eruptions in the eastern Aleutian arc, Alaska". Geology. 15 (5): 434–438. Bibcode:1987Geo....15..434M. doi:10.1130/0091-7613(1987)15<434:LQCEIT>2.0.CO;2. ISSN 0091-7613. ^ Global Volcanism Program|Okmok|Summary. Volcano.si.edu. Retrieved on 2010-11-24. ^ "Mount Tulik in eruption", Fairbanks Daily News-Miner. January 2, 1936. Page A1. ^ "Alaska volcano erupts; island residents evacuated". Reuters. July 13, 2008. Retrieved 2008-07-13. Wikimedia Commons has media related to Okmok volcano. "Okmok". Global Volcanism Program. Smithsonian Institution.